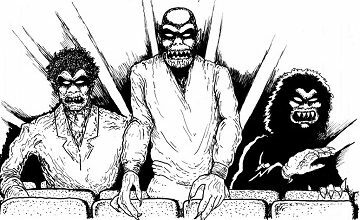 On this episode of the Really Awful Movies Podcast, what is arguably the greatest horror remake of all time, The Fly (not that we want to argue, but if anyone wants to step up to the lectern and make a case for The Thing or Invasion of the Body Snatchers, we’d be happy to entertain it). Flies and death are synonymous. This wasn’t news to our man David Cronenberg, who gave new life to a fly-man hybrid, Dr. Seth Brundle. 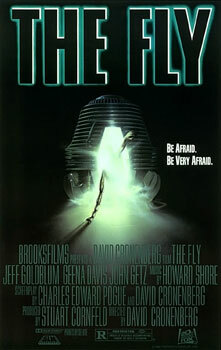 The genius doctor, played by Jeff Goldblum, builds a tele-porting device and manages to move matter from one place to another, only getting into trouble when he puts himself in the machine and a fly gets in with him, creating something monstrous in this, a film that came about during the infancy of recombinant DNA technology. Along for the ride is a science journalist Veronica (Goldblum’s then girlfriend, actress Geena Davis) and what we get is essentially a love story set against this very odd backdrop: a man pushing the limits of the human form, transmogrifying into something truly terrifying. There are many interpretations of what this film is about, the most prominent of which is the insect change as AIDS subtext. Watch it and see, as it remains as fresh and shocking as it must’ve seemed to movie-going audiences back in 1986.